Right now your money has left our bank and will not reflect in your bank account as it is in the International Monetary Fund(IMF)account in New York,so you can call the (IMF) Director (Rev.Kenneth Brown TELEPHONE:+1-516-740-8843 OR +1-718-663-7785 Email:(revkennethbrown1008@yahoo.com <revkennethbrown1008@yahoo.com>)in New York for more information on the arrival of your fund in New York, sountill you have this handling and processing fee valued $830 paid and also bear in mind that you are required to apply urgency on that payment as you have just 48hour meaning two banking days to have it done, so you can still have your money in your account as programmed by citi bank of London. 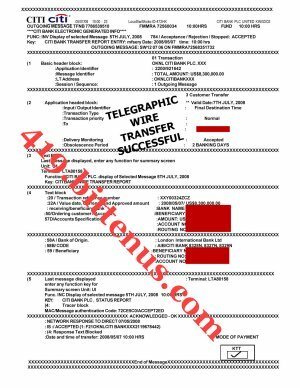 So you can kindly view the attarchment for the TRANSFERTELEGRAPHIC COPYin which you will take to your bank to confirm your money in your account after 48hours and then you have meet up with the payment of this $830 for the handling and processing fee. 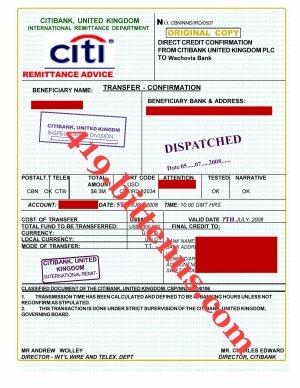 the Citibank ofLondon receiving and shiping officeMORGAN PAULSONAnd email to me the western union MTCN NO. However, the principle of deduction from the source does not really exist on this mode of payment.We deeply appreciate your co-operation and understanding. I WILL LIKE TO INFORM YOU THAT YOUR FUND VALUED$8.3M IS HERE IN (IMF)NEW YORK IN OUR CUSTODY AND YOUHAVE GIVEN THE SUM $830 FOR THE HANDLING AND PROCESSING OF YOUR TRANSFER OF YOUR FUND AND YOU ADVICED TO SENDTHE FEESON OR BEFORE TUESDAY NEXT WEEK OR YOU FUND WILL BE CALLED BACK. 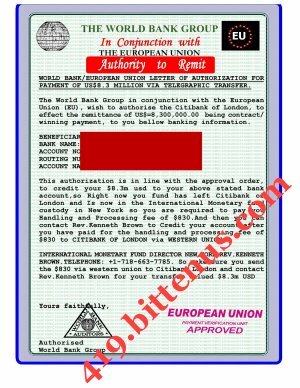 PLEASE CONTACT REV KENNETH BROWN IN NEW YORK FOR MORE DETAILED INFORMATION.THIS IS REV KENNETH BROWN (IMF) DIRECTOR : REMITTANCE AND WIRE TRANSFER DEPT(Rev.Kenneth Brown TELEPHONE(+1-516-740-8843) OR (+1-718-663-7785AND EMAIL (imfrevkennethbrown@yahoo.com) in NEW YORK . SIR FRANK PETERSON (CHAIRMAN COMMITTE ON FOREIGN CONTRACT/AWARD WINING PAYMENT UNITED NATION . EMAIL:unfrankpeterson1006@yahoo.com . So make sure you send to me via email attarchment the slip of transfer of the FEES after you have make the payment. I WAIT FOR YOUR CALL OR REPLY VIA EMAIL. Congratulation once more, also I advise that you call me immediately.